The Late Middle Ages or Late Medieval Period was the period of European history generally comprising the 14th and 15th centuries (c. 1301–1500). The Late Middle Ages followed the High Middle Ages and preceded the onset of the early modern era (and, in much of Europe, the Renaissance). 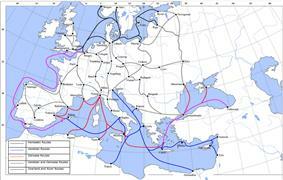 Around 1300, centuries of prosperity and growth in Europe came to a halt. A series of famines and plagues, such as the Great Famine of 1315–1317 and the Black Death, reduced the population to around half of what it was before the calamities. Along with depopulation came social unrest and endemic warfare. France and England experienced serious peasant uprisings: the Jacquerie, the Peasants' Revolt, as well as over a century of intermittent conflict in the Hundred Years' War. To add to the many problems of the period, the unity of the Catholic Church was shattered by the Western Schism. Collectively these events are sometimes called the Crisis of the Late Middle Ages. Despite these crises, the 14th century was also a time of great progress within the arts and sciences. Following a renewed interest in ancient Greek and Roman texts that took root in the High Middle Ages, the Italian Renaissance began. The absorption of Latin texts had started before the Renaissance of the 12th century through contact with Arabs during the Crusades, but the availability of important Greek texts accelerated with the capture of Constantinople by the Ottoman Turks, when many Byzantine scholars had to seek refuge in the West, particularly Italy. Combined with this influx of classical ideas was the invention of printing which facilitated dissemination of the printed word and democratized learning. These two things would later lead to the Protestant Reformation. Toward the end of the period, an era of discovery began (Age of Discovery). The growth of the Ottoman Empire, culminating in the Fall of Constantinople in 1453, eroded the last remnants of the Byzantine Empire and cut off trading possibilities with the east. Europeans were forced to discover new trading routes, as was the case with Columbus’s travel to the Americas in 1492, and Vasco da Gama’s circumnavigation of India and Africa in 1498. Their discoveries strengthened the economy and power of European nations. The changes brought about by these developments have caused many scholars to see it as leading to the end of the Middle Ages, and the beginning of modern history and early modern Europe. However, the division will always be a somewhat artificial one for scholars, since ancient learning was never entirely absent from European society. As such there was developmental continuity between the ancient age (via classical antiquity) and the modern age. Some historians, particularly in Italy, prefer not to speak of late Middle Ages at all, but rather see the high period of the Middle Ages transitioning to the Renaissance and the modern era. The term "Late Middle Ages" refers to one of the three periods of the Middle Ages, the others being the Early Middle Ages and the High Middle Ages. Leonardo Bruni was the first historian to use tripartite periodization in his History of the Florentine People (1442). 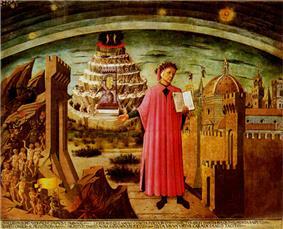 Flavio Biondo used a similar framework in Decades of History from the Deterioration of the Roman Empire (1439–1453). Tripartite periodization became standard after the German historian Christoph Cellarius published Universal History Divided into an Ancient, Medieval, and New Period (1683). For 18th-century historians studying the 14th and 15th centuries, the central theme was the Renaissance, with its rediscovery of ancient learning and the emergence of an individual spirit. The heart of this rediscovery lies in Italy, where, in the words of Jacob Burckhardt: "Man became a spiritual individual and recognized himself as such" (The Civilization of the Renaissance in Italy, 1860). This proposition was later challenged, and it was argued that the 12th century was a period of greater cultural achievement. 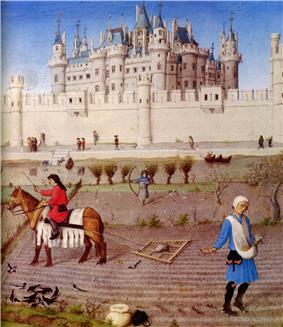 As economic and demographic methods were applied to the study of history, the trend was increasingly to see the late Middle Ages as a period of recession and crisis. Belgian historian Henri Pirenne introduced the now common subdivision of Early, High and Late Middle Ages in the years around World War I. Yet it was his Dutch colleague Johan Huizinga who was primarily responsible for popularising the pessimistic view of the Late Middle Ages, with his book The Autumn of the Middle Ages (1919). To Huizinga, whose research focused on France and the Low Countries rather than Italy, despair and decline were the main themes, not rebirth. Modern historiography on the period has reached a consensus between the two extremes of innovation and crisis. It is now (generally) acknowledged that conditions were vastly different north and south of the Alps, and "Late Middle Ages" is often avoided entirely within Italian historiography. The term "Renaissance" is still considered useful for describing certain intellectual, cultural or artistic developments, but not as the defining feature of an entire European historical epoch. The period from the early 14th century up until – sometimes including – the 16th century, is rather seen as characterised by other trends: demographic and economic decline followed by recovery, the end of western religious unity and the subsequent emergence of the nation state, and the expansion of European influence onto the rest of the world. The situation gradually led to the consolidation of central authority, and the emergence of the nation state. The financial demands of war necessitated higher levels of taxation, resulting in the emergence of representative bodies – most notably the English Parliament. The growth of secular authority was further aided by the decline of the papacy with the Western Schism, and the coming of the Protestant Reformation. After the failed union of Sweden and Norway of 1319–1365, the pan-Scandinavian Kalmar Union was instituted in 1397. The Swedes were reluctant members of the Danish-dominated union from the start. In an attempt to subdue the Swedes, King Christian II of Denmark had large numbers of the Swedish aristocracy killed in the Stockholm Bloodbath of 1520. Yet this measure only led to further hostilities, and Sweden broke away for good in 1523. Norway, on the other hand, became an inferior party of the union, and remained united with Denmark until 1814. Iceland benefited from its relative isolation, and was the last Scandinavian country to be struck by the Black Death. Meanwhile, the Norse colony in Greenland died out, probably under extreme weather conditions in the 15th century. These conditions might have been the effect of the Little Ice Age. The death of Alexander III of Scotland in 1286 threw the country into a succession crisis, and the English king, Edward I, was brought in to arbitrate. When Edward claimed overlordship over Scotland, this led to the Wars of Scottish Independence. The English were eventually defeated, and the Scots were able to develop a stronger state under the Stewarts. From 1337, England's attention was largely directed towards France in the Hundred Years' War. 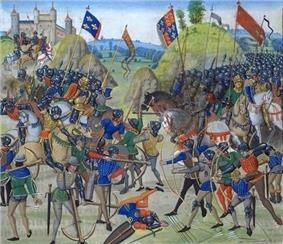 Henry V’s victory at the Battle of Agincourt in 1415 briefly paved the way for a unification of the two kingdoms, but his son Henry VI soon squandered all previous gains. The loss of France led to discontent at home, and almost immediately upon the end of the war in 1453, followed the dynastic struggles of the Wars of the Roses (c. 1455–1485), involving the rival dynasties of Lancaster and York. The war ended in the accession of Henry VII of the Tudor family, who could continue the work started by the Yorkist kings of building a strong, centralized monarchy. While England's attention was thus directed elsewhere, the Hiberno-Norman lords in Ireland were becoming gradually more assimilated into Irish society, and the island was allowed to develop virtual independence under English overlordship. The French House of Valois, which followed the House of Capet in 1328, was at its outset virtually marginalized in its own country, first by the English invading forces of the Hundred Years' War, later by the powerful Duchy of Burgundy. 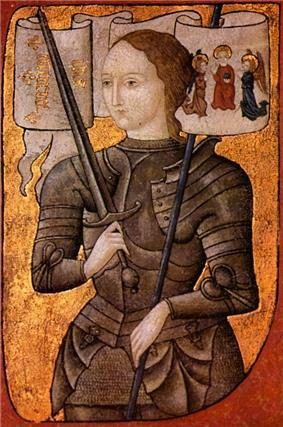 The appearance of Joan of Arc on the scene changed the course of war in favour of the French, and the initiative was carried further by King Louis XI. Bohemia prospered in the 14th century, and the Golden Bull of 1356 made the king of Bohemia first among the imperial electors, but the Hussite revolution threw the country into crisis. The Holy Roman Empire passed to the Habsburgs in 1438, where it remained until the Empire's dissolution in 1806. Yet in spite of the extensive territories held by the Habsburgs, the Empire itself remained fragmented, and much real power and influence lay with the individual principalities. Also financial institutions, such as the Hanseatic League and the Fugger family, held great power, both on an economic and a political level. The kingdom of Hungary experienced a golden age during the 14th century. In particular the reign of the Angevin kings Charles Robert (1308–42) and his son Louis the Great (1342–82) were marked by greatness. The country grew wealthy as the main European supplier of gold and silver. Louis the Great led successful campaigns from Lithuania to Southern Italy, From Poland to Northern Greece. He had the greatest military potential of the 14th century with his enormous armies. (Often over 100,000 men). Meanwhile, Poland's attention was turned eastwards, as the union with Lithuania created an enormous entity in the region. The union, and the conversion of Lithuania, also marked the end of paganism in Europe. However, Louis did not leave a son as heir after his death in 1382. Instead, he named as his heir the young prince Sigismund of Luxemburg who was 11 years old. The Hungarian nobility did not accept his claim, and the result was an internal war. Sigismund eventually achieved total control of Hungary, and established his court in Buda and Visegrád. Both palaces were rebuilt and improved, being considered between the richest of its time in Europe. Inheriting the throne of Bohemia and the Holy Roman Empire, Sigismund continued conducting his politics from Hungary, but being busy fighting the Hussites, and the Ottoman Empire which started to become an important menace to Europe in the beginning of the 15th century. The King Matthias Corvinus of Hungary was known to hold the biggest army of mercenaries of his time (The Black Army of Hungary) which he used to conquer Bohemia, Austria and fight the Ottoman Empire's menace. However, the end of the glory of the Kingdom happened in the beginning of the 16th century, when the King Louis II of Hungary was killed in the battle of Mohács in 1526 against the Ottoman Empire. Then Hungary fell in a serious crisis and was invaded, ending not only its significance in central Europe, but its medieval time with it. The 13th century had seen the fall of the state of Kievan Rus', in the face of the Mongol invasion. In its place would eventually emerge the Grand Duchy of Moscow, which won a great victory against the Golden Horde at the Battle of Kulikovo in 1380. The victory did not end Tartar rule in the region, however, and its immediate beneficiary was Lithuania, which extended its influence eastwards. It was under the reign of Ivan III, the Great (1462–1505), that Moscow finally became a major regional power, and the annexation of the vast Republic of Novgorod in 1478 laid the foundations for a Russian national state. After the Fall of Constantinople in 1453 the Russian princes started to see themselves as the heirs of the Byzantine Empire. They eventually took on the imperial title of Tsar, and Moscow was described as the Third Rome. The Byzantine Empire had for a long time dominated the eastern Mediterranean in politics and culture. By the 14th century, however, it had almost entirely collapsed into a tributary state of the Ottoman Empire, cenetred on the city of Constantinople and a few enclaves in Greece. With the Fall of Constantinople in 1453, the Byzantine Empire was permanently extinguished. The Bulgarian Empire was in decline by the 14th century, and the ascendancy of Serbia was marked by the Serbian victory over the Bulgarians in the Battle of Velbazhd in 1330. By 1346, the Serbian king Stefan Dušan had been proclaimed emperor. 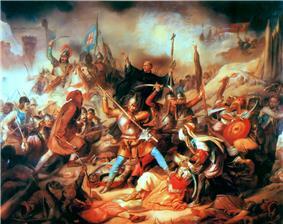 Yet Serbian dominance was short-lived; the Serbian armies led by the Lazar Hrebljevanovic were defeated by the Ottomans at the Battle of Kosovo in 1389, where most of the Serbian nobility was killed and the south of the country came under Ottoman occupation, as much of southern Bulgaria had become Ottoman territory in 1371. Northern remnants of Bulgaria were finally conquered by 1396, Serbia fell in 1459, Bosnia in 1463, and Albania was finally subordinated in 1479 only a few years after the death of Skanderbeg. Belgrade, Hungarian domain at the time was the last large Balkan city to fall under Ottoman rule in 1521. By the end of the medieval period, the entire Balkan peninsula was annexed by, or became vassal to the Ottomans. Avignon was the seat of the papacy from 1309 to 1376. With the return of the Pope to Rome in 1378, the Papal State developed into a major secular power, culminating in the morally corrupt papacy of Alexander VI. Florence grew to prominence amongst the Italian city-states through financial business, and the dominant Medici family became important promoters of the Renaissance through their patronage of the arts. Also other city states in northern Italy expanded their territories and consolidated their power, primarily Milan and Venice. The War of the Sicilian Vespers had by the early 14th century divided southern Italy into an Aragon Kingdom of Sicily and an Anjou Kingdom of Naples. In 1442, the two kingdoms were effectively united under Aragonese control. The 1469 marriage of Isabella I of Castile and Ferdinand II of Aragon and 1479 death of John II of Aragon led to the creation of modern-day Spain. In 1492, Granada was captured from the Moors, thereby completing the Reconquista. Portugal had during the 15th century – particularly under Henry the Navigator – gradually explored the coast of Africa, and in 1498, Vasco da Gama found the sea route to India. The Spanish monarchs met the Portuguese challenge by financing Columbus’s attempt to find the western sea route to India, leading to the discovery of America in the same year as the capture of Granada. 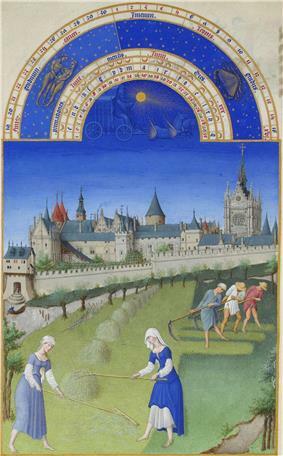 Around 1300–1350 the Medieval Warm Period gave way to the Little Ice Age. The colder climate resulted in agricultural crises, the first of which is known as the Great Famine of 1315-1317. The demographic consequences of this famine, however, were not as severe as the plagues that occurred later in the century, particularly the Black Death. Estimates of the death rate caused by this epidemic range from one third to as much as sixty percent. By around 1420, the accumulated effect of recurring plagues and famines had reduced the population of Europe to perhaps no more than a third of what it was a century earlier. The effects of natural disasters were exacerbated by armed conflicts; this was particularly the case in France during the Hundred Years' War. The upheavals caused by the Black Death left certain minority groups particularly vulnerable, especially the Jews. The calamities were often blamed on this group, and anti-Jewish pogroms were carried out all over Europe; in February 1349, 2,000 Jews were murdered in Strasbourg. Also the state was guilty of discrimination against the Jews, as monarchs gave in to the demands of the people, the Jews were expelled from England in 1290, from France in 1306, from Spain in 1492 and from Portugal in 1497. 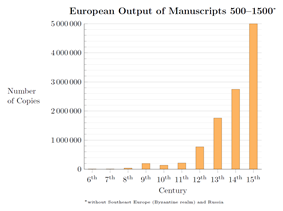 Up until the mid-14th century, Europe had experienced a steadily increasing urbanisation. Cities were of course also decimated by the Black Death, but the urban areas' role as centres of learning, commerce and government ensured continued growth. By 1500 Venice, Milan, Naples, Paris and Constantinople probably had more than 100,000 inhabitants. Twenty-two other cities were larger than 40,000; most of these were to be found in Italy and the Iberian peninsula, but there were also some in France, the Empire, the Low Countries plus London in England. Through battles such as cavalry was lost, and that a well equipped infantry was preferable. Through the Welsh Wars the English became acquainted with, and adopted the highly efficient longbow. Once properly managed, this weapon gave them a great advantage over the French in the Hundred Years' War. Parallel to the military developments emerged also a constantly more elaborate Charles I of Hungary in 1325, the best known probably the English Order of the Garter, founded by Edward III in 1348. Though many of the events were outside the traditional time-period of the Middle Ages, the end of the unity of the Western Church (the Protestant Reformation), was one of the distinguishing characteristics of the medieval period. The Catholic Church had long fought against heretic movements, in the Late Middle Ages, it started to experience demands for reform from within. The first of these came from the Oxford professor John Wycliffe in England. Wycliffe held that the Bible should be the only authority in religious questions, and spoke out against transubstantiation, celibacy and indulgences. In spite of influential supporters among the English aristocracy, such as John of Gaunt, the movement was not allowed to survive. Though Wycliffe himself was left unmolested, his supporters, the Lollards, were eventually suppressed in England. Richard II of England's marriage to Anne of Bohemia established contacts between the two nations and brought Lollard ideas to this part of Europe. 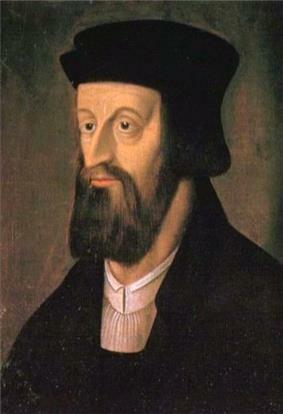 The teachings of the Czech priest Jan Hus were based on those of John Wyclif, yet his followers, the Hussites, were to have a much greater political impact than the Lollards. Hus gained a great following in Bohemia, and in 1414, he was requested to appear at the Council of Constance, to defend his cause. 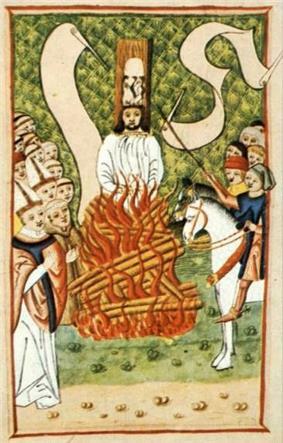 When he was burned as a heretic in 1415, it caused a popular uprising in the Czech lands. The subsequent Hussite Wars fell apart due to internal quarrels, and did not result in religious or national independence for the Czechs, but both the Catholic Church and the German element within the country were weakened. Martin Luther, a German monk, started the German Reformation by the posting of the 95 theses on the castle church of Wittenberg on October 31, 1517. The immediate provocation behind the act was Pope Leo X’s renewing the indulgence for the building of the new St. Peter's Basilica in 1514. Luther was challenged to recant his heresy at the Diet of Worms in 1521. When he refused, he was placed under the ban of the Empire by Charles V. Receiving the protection of Frederick the Wise, he was then able to translate the Bible into German. To many secular rulers the Protestant reformation was a welcome opportunity to expand their wealth and influence. The Catholic Church met the challenges of the reforming movements with what has been called the Catholic or Counter-Reformation. 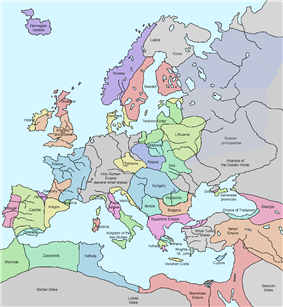 Europe became split into a northern Protestant and a southern Catholic part, resulting in the Religious Wars of the 16th and 17th centuries. In the late 13th and early 14th centuries, a process took place – primarily in Italy but partly also in the Empire – that historians have termed a 'commercial revolution'. Among the innovations of the period were new forms of partnership and the issuing of insurance, both of which contributed to reducing the risk of commercial ventures; the bill of exchange and other forms of credit that circumvented the canonical laws for gentiles against usury, and eliminated the dangers of carrying bullion; and new forms of accounting, in particular double-entry bookkeeping, which allowed for better oversight and accuracy. Though there is no doubt that the demographic crisis of the 14th century caused a dramatic fall in production and commerce in absolute terms, there has been a vigorous historical debate over whether the decline was greater than the fall in population. While the older orthodoxy was that the artistic output of the Renaissance was a result of greater opulence, more recent studies have suggested that there might have been a so-called 'depression of the Renaissance'. In spite of convincing arguments for the case, the statistical evidence is simply too incomplete that a definite conclusion can be made. In science, classical authorities like Aristotle were challenged for the first time since antiquity. Within the arts, humanism took the form of the Renaissance. Though the 15th century Renaissance was a highly localised phenomenon – limited mostly to the city states of northern Italy – artistic developments were taking place also further north, particularly in the Netherlands. The predominant school of thought in the 13th century was the Thomistic reconciliation of the teachings of Aristotle with Christian theology. The Condemnation of 1277, enacted at the University of Paris, placed restrictions on ideas that could be interpreted as heretical; restrictions that had implication for Aristotelian thought. An alternative was presented by William of Ockham, who insisted that the world of reason and the world of faith had to be kept apart. Ockham introduced the principle of parsimony – or Occam's razor – whereby a simple theory is preferred to a more complex one, and speculation on unobservable phenomena is avoided. Certain technological inventions of the period – whether of Gutenberg's movable type printing press made possible not only the Reformation, but also a dissemination of knowledge that would lead to a gradually more egalitarian society. The compass, along with other innovations such as the cross-staff, the mariner's astrolabe, and advances in shipbuilding, enabled the navigation of the World Oceans, and the early phases of colonialism. Other inventions had a greater impact on everyday life, such as eyeglasses and the weight-driven clock. 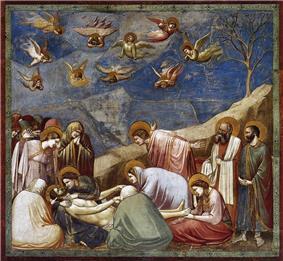 Giotto’s Lamentation (The Mourning of Christ), Scrovegni Chapel. Giotto's three-dimensional and psychologically convincing characters were a precursor to the Renaissance. A precursor to Renaissance art can be seen already in the early 14th-century works of Giotto. Giotto was the first painter since antiquity to attempt the representation of a three-dimensional reality, and to endow his characters with true human emotions. The most important developments, however, came in 15th century Florence. The affluence of the merchant class allowed extensive patronage of the arts, and foremost among the patrons were the Medici. Morality plays emerged as a distinct dramatic form around 1400 and flourished until 1550. 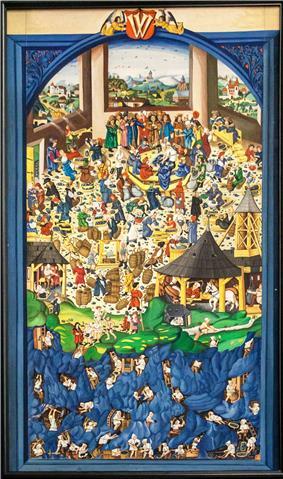 The most interesting morality play is The Castle of Perseverance which depicts mankind's progress from birth to death. However, the most famous morality play and perhaps best known medieval drama is Everyman. Everyman receives Death's summons, struggles to escape and finally resigns himself to necessity. Along the way, he is deserted by Kindred, Goods, and Fellowship - only Good Deeds goes with him to the grave. After the end of the late Middle Ages period, the Renaissance would spread unevenly over continental Europe from the southern European region. The intellectual transformation of the Renaissance is viewed as a bridge between the Middle Ages and the Modern era. Europeans would later begin an era of world discovery. Combined with the influx of classical ideas was the invention of printing which facilitated dissemination of the printed word and democratized learning. These two things would lead to the Protestant Reformation. Europeans also discovered new trading routes, as was the case with Columbus’s travel to the Americas in 1492, and Vasco da Gama’s circumnavigation of Africa and India in 1498. Their discoveries strengthened the economy and power of European nations. At the end of the 15th century the Ottoman Empire advanced all over Southeastern Europe, eventually conquering the Byzantine Empire and extending control over the Balkan states. Hungary was the last bastion of the Latin Christian world in the East, and fought to keep its rule over a period of two centuries. After the tragic death of the young king Vladislaus I of Hungary during the Battle of Varna in 1444 against the Ottomans, the Kingdom was placed in the hands of count John Hunyadi, who became Hungary's regent-governor (1446–1453). Hunyadi was considered one of the most relevant military figures of the 15th century: Pope Pius II awarded him the title of Athleta Christi or Champion of Christ for being the only hope of resisting the Ottomans from advancing to Central and Western Europe. 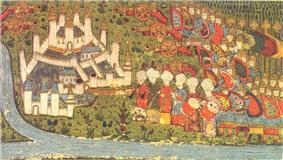 Hunyadi succeeded during the Siege of Belgrade in 1456 against the Ottomans, the biggest victory against that empire in decades. This battle became a real Crusade against the Muslims, as the peasants were motivated by the Franciscan monk Saint John of Capistrano, who came from Italy predicating Holy War. The effect that it created in that time was one of the main factors that helped in achieving the victory. However the premature death of the Hungarian Lord left Pannonia defenseless and in chaos. In an extremely unusual event for the Middle Ages, Hunyadi's son, Matthias, was elected as King of Hungary by the nobility. For the first time, a member of an aristocratic family (and not from a royal family) was crowned. King Black Army of mercenary soldiers; it was considered as the biggest army of its time. Using this powerful tool, the Hungarian king led wars against the Turkish armies and stopped the Ottomans during his reign. 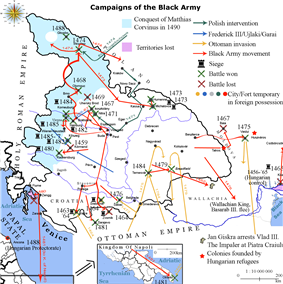 After the death of Matthew, and with end of the Black Army, the Ottoman Empire grew in strength and Central Europe was defenseless. At the Battle of Mohács, the forces of the Ottoman Empire annihilated the Hungarian army and Louis II of Hungary drowned in the Csele Creek while trying to escape. The leader of the Hungarian army, Pál Tomori, also died in the battle. This is considered to be one of the final battles of Medieval times. 1492 - Christopher Columbus reached the "New World"
Brady, Thomas A., Jr., Heiko A. Oberman, James D. Tracy (eds.) (1994). Handbook of European History, 1400–1600: Late Middle Ages, Renaissance and Reformation. Leiden, New York: E.J. Brill. Hollister, C. Warren (2005). Medieval Europe: A Short History (10th ed.). McGraw-Hill Higher Education. Waley, Daniel; Denley, Peter (2001). Later Medieval Europe: 1250-1520 (3rd ed.). London: Longman. Fine, John V.A. (1994). The Late Medieval Balkans: A Critical Survey from the Late Twelfth Century to the Ottoman Conquest (Reprint ed.). Ann Arbor: University of Michigan Press. Martin, Janet (2007). Medieval Russia, 980–1584 (2nd ed.). Cambridge: Cambridge University Press. Najemy, John M. (ed.) (2004). Italy in the Age of the Renaissance: 1300-1550 (New ed.). Oxford: Oxford University Press. Petry, Carl F. (1998). The Cambridge History of Egypt, Volume 1. Cambridge: E.J. Brill. Reilly, Bernard F. (2008). 978-1845115494. Cambridge: I. B. Tauris. Wandycz, Piotr (2001). The Price of Freedom: A History of East Central Europe from the Middle Ages to the Present (2nd ed.). London: Routledge. Behrens-Abouseif, Doris (1994). Cairo of the Mamluks: A History of Architecture and its Culture (Reprint ed.). Ann Arbor: University of Michigan Press. Chazan, Robert (2006). The Jews of Medieval Western Christendom: 1000-1500. Cambridge: Cambridge University Press. Herlihy, David (1968). Medieval Culture and Society. London: Macmillan. Klapisch-Zuber, Christiane (1994). A history of women in the West (New ed.). Cambridge, Mass. ; London: Harvard University Press. Horrox, Rosemary (1994). The Black Death. Manchester: Manchester University Press. Shillington, Kevin (2004). Encyclopedia of African History, Volume 1 (1st ed.). Taylor & Francis, Inc.: Cambridge University Press. Allmand, Christopher (1988). The Hundred Years War: England and France at War c.1300-c.1450. Cambridge: Cambridge University Press. Chase, Kenneth (2003). Firearms: A Global History to 1700. Cambridge: Cambridge University Press. Contamine, Philippe (1984). War in the Middle Ages. Oxford: Blackwell. Davis, Paul K. (2001). 100 Decisive Battles: From Ancient Times to the Present. Oxford: Oxford University Press. Keen, Maurice (1984). Chivalry. New Haven: Yale University Press. Verbruggen, J. F. (1997). The Art of Warfare in Western Europe during the Middle Ages: From the Eighth Century to 1340 (2nd ed.). Woodbridge: Boydell Press. Cipolla, Carlo M. (ed.) (1993). The Fontana Economic History of Europe, Volume 1: The Middle Ages (2nd ed.). New York: Fontana Books. Pounds, N.J.P. (1994). An Economic History of Medieval Europe (2nd ed.). London and New York: Longman. Smith, John H. (1970). The Great Schism, 1378. London: Hamilton. Brotton, Jerry (2006). The Renaissance: A Very Short Introduction. Oxford: Oxford University Press. Snyder, James (2004). Northern Renaissance Art: Painting, Sculpture, the Graphic Arts from 1350 to 1575 (2nd ed.). Prentice Hall. Welch, Evelyn (2000). Art in Renaissance Italy, 1350-1500 (reprint ed.). Oxford: Oxford University Press. Wilson, David Fenwick (1990). 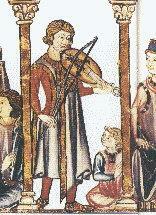 Music of the Middle Ages. New York: Schirmer Books. ^ Le Goff, p. 154. See e.g. Najemy, John M. (2004). Italy in the Age of the Renaissance: 1300–1550. Oxford: Oxford University Press. ^ Grove, Jean M. (2003). The Little Ice Age. London: Routledge. ^ Harvey, Barbara F. (1991). "Introduction: The 'Crisis' of the Early Fourteenth Century". In Campbell, B.M.S. Before the Black Death: Studies in The 'Crisis' of the Early Fourteenth Century. Manchester: Manchester University Press. pp. 1–24. ^ Hans Thijssen (2003). "Condemnation of 1277".